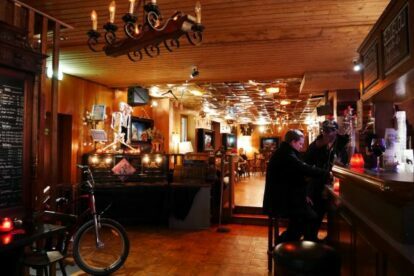 Smack dab in the middle of the city, a stone’s throw away from every single university building in Geneva, Le Bouffon de La Taverne is the student bar Geneva has always needed. Despite not being one myself anymore, I still like my beverages cheap and delicious, and the tavern caters to both those needs. The Bouffon is the only place I know of in Geneva that serves mead (honey wine, yummy!) and Jo, the sideburned barkeep makes his own flavored rhums, which he stores high up behind the bar for all to see and drool over. When he deems one of his concoctions ready for consumption, it is always a taste to behold! The Bouffon is always full, every day of the week, and has plenty of room to accommodate large groups for birthdays, student parties or concerts of which there are plenty all week… You will never find yourself there on a dull day! The first floor is a quiet, couch-filled lounge area with a huge (full) bookshelf, decorated with books nailed to the walls and lamps that look like bunnies or a pig (or not. Jo likes to change things from time to time), and the basement is a concert venue, with varied programming.